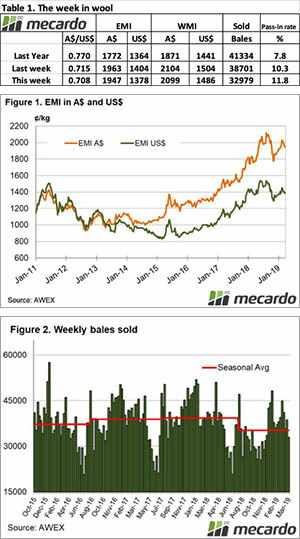 The recent pattern of buyers chasing after the small offering of quality wool, while at the same time finding an over supply of drought effected types continued. While this pattern of supply is broadly following a well-worn seasonal path, the situation is at the current elevated levels because of the drought. It will take some time for this to flow through with wool shorn over the next 6 months at least also drought effected. Auction volumes to the end of March make interesting reading, especially when broken down by category. 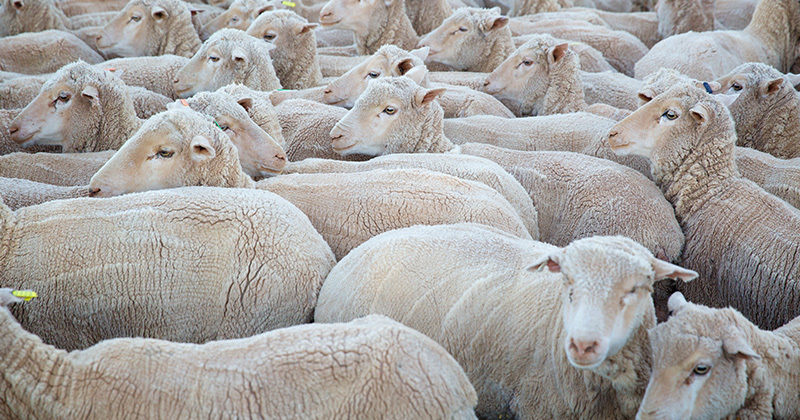 AWEX figures show that comparing year on year the overall volume of wool offered for auction is 11.5% lower. However, as an example, the 16 MPG is 20.4% higher, with the 19 MPG 5.6% lower. However, as a result of the dry conditions, the big mover is the medium microns. The 21 MPG is down a massive 47.8% compared to last year; this helps understand some of the reasons for the current market dynamic. To re-enforce the drought effect, AWEX noted that 30% of Merino fleece this week was yielding less than 60%. The Eastern Market Indicator (EMI) again fell 16 cents to 1,947 cents. The Au$ fell back below the US $0.71 mark, with the EMI in US$ terms also losing 21 cents to end the week at 1,382 US cents (Table 1). In Fremantle, the Western Market Indicator (WMI) declined by 5 cents to finish at 2,099 cents. 37,405 bales were offered for sale this week, 5,724 less than last week with the trade clearing 32,979. This is 5,722 fewer bales than last week, with the pass-in rate remaining in double digit figures at 11.8%. In the auction weeks since the winter recess, 1,092,065 bales have been cleared to the trade, 199,596 fewer than the same period last year. The average shortfall cleared to the trade compared to the same time last year now sits at 6,438 bales per week fewer. The dollar value for the week was $67.22 million for a combined value of $2.555 billion so far this season. A simple calculation of $ value divided by bales sold gives us $2,038 per bale across all types. Crossbreds again were the only category to see improvements this week, lifting 10 to 20 cents, however the Cardings sector continued to decline losing 30 to 40 cents. The roster for next week predicts an offering of 38,212 bales followed by 35,945 and 41,055 in the weeks proceeding.